Bring home a piece of the Ancient Roman Empire! 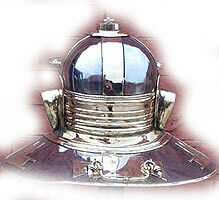 The Imperial - Gallic Italic Helmets are here at Ancient Rome Gifts at RomeGiftShop.com! Order your Roman Imperial - Gallic Italic Helmet now! An incredible piece from Ancient Rome and the days of the Ancient Roman Colosseum! This late 2nd - 3rd century helmet is the latest example of the Roman imperial helmets and is clearly derived from the 1st-Century Imperial Italic Helmets. An amazing reproduction and expertly hand-crafted in iron and brass! AH6304 Imperial Gallic -Italic Helmet Legionary Helmets and dates to around 200AD.